A hat-tip to journalist and educator Ted Gup for a terrific story about his discovery of a classic work of journalism history — the copy of How the Other Half Lives that was owned and annotated by the author himself, Jacob Riis. As I described him in my book, Covering America, Riis (pronounced rees) was a Danish immigrant to New York City who was shocked and outraged by the conditions he found in the city’s many tenements in the late 19th century. Picking up his notebook and a camera (equipped with a then-new technology — the portable flash), he explored the warrens of tiny, windowless rooms where New York’s newest and most miserable found cheap housing. In buildings lacking heat, ventilation and plumbing, the masses huddled while the wealthy were building ever grander pleasure domes uptown on Fifth Avenue and the rest of the Upper East Side. His work also provided a template for the journalists of the classic “muckraking” movement in the first decade of the 20th Century. An important thing to know about Riis’ expose, published in 1890, is that it had an impact. His photos and writing contributed to a political demand for improvements in New York City housing codes, which resulted in concrete improvements in the tenements. The city adopted new building codes that required more light, less crowding and, eventually, heat and plumbing. In his piece in today’s Times, Gup — an investigative journalist himself who now chairs the Journalism Dept at crosstown Emerson College — describes how he stumbled upon a first edition of How the Other Half Lives that contains Riis’ own handwritten comments and marginalia. He also rightly commends Riis as a “multimedia” journalist for his combining of text and photos (and his use of a flash to light up those dark inner rooms of the tenements). As many have observed (including the city’s new mayor, Bill DeBlasio), Riis is as relevant as ever, now that New York City is living through another Gilded Age in which wealth is as unevenly distributed as it was in the days of Rockefeller, Morgan, and Hearst. 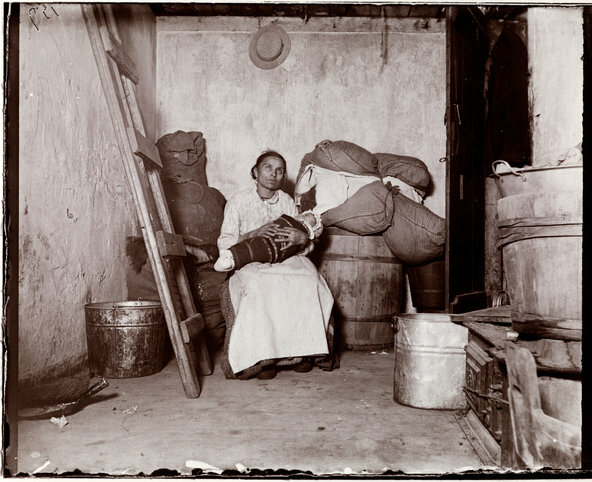 “The Italian Rag-picker,” by Jacob Riis, from his book, How the Other Half Lives. Photo from Museum of the City of New York.